Welcome to another Creative Knockouts Challenge and this week we are featuring all cards with Borders! 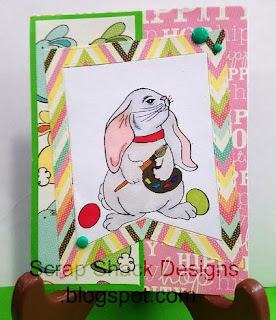 Borders are so much fun to play around with and can be interpreted in so many different ways so I really hope that you come on over to CK and play along with us. Our sponsor this week is All Dressed Up and will provide one lucky winner with two free images. Ok so I at first went straight to my Cricut and was going to create this card with a bottom shape cut out of it, but then I looked up and realized that I have so many beautiful border punches that I never use so I grabbed one of those and got to work. This beautiful image is called Butterfly Kisses, rightfully so, and was a lot of fun to create with. I paired the image, from All Dressed Up, with the Make Waves paper line from CTMH. The butterfly was cut out using my Cricut and that purple border came from one of my punches. I love the butterfly die but thought that it was missing a little something so I reached for my shimmer brush and brushed some glitter onto it. I also thought that the purple ribbon from the Whimsy pack fit this card perfectly so I added that to the top of my border. I layered the image onto white cardstock and teal cardstock which also came from the Make Waves coordinating line. Thanks for checking out my project today. 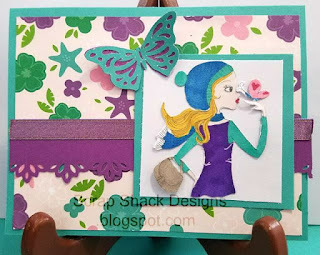 I hope to see you over at Creative Knockouts for this weeks challenge. So as you may already know our monthly challenge for March is to use Die Cuts on your project which was just perfect for me, especially since I got a new Big Shot for Xmas, so I grabbed my Just For Fun stamps and a couple of flag dies and got right to work. 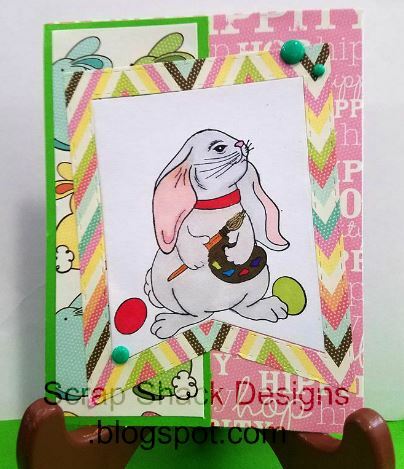 Don't you just love that Bunny Artist stamp?? I mean I loved it and then I stamped it and fell even more in love with it. As far as the image goes I stamped it using Archival Black ink and used my Shi Han alcohol markers to color it in. I used a lighter and darker shade of the pink and the grey to provide a little bit of shading. I then topped it all off by adding some "Cats and Bats" teal dots. Thanks for stopping by today. I hope you were inspired to come along and play with our monthly challenge. 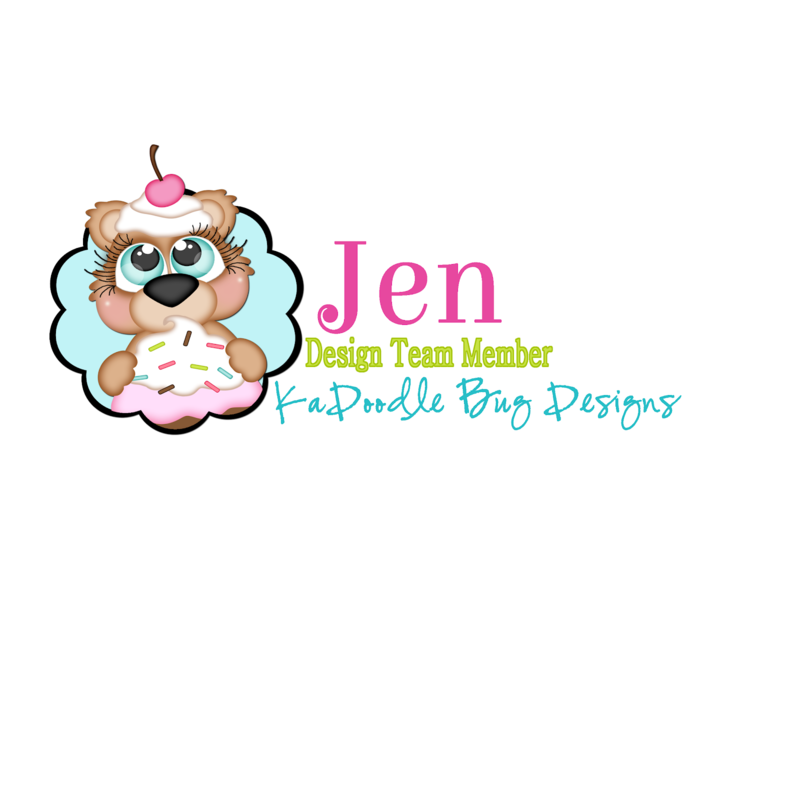 This was part of my February Creative Club which are always really fun LIVE classes that me and some other ladies "attend" virtually. If you are interested in this tutorial then all you have to do is purchase the kit contents above and I will email you the complete tutorial for FREE!! Right talk about an amazing deal. Also if you are interested in checking out this month's creative club then make sure to join us over at Scrappin' Happens on facebook. In March we will be using the following materials to put together 6 12" x 12" layouts. Again if you have never joined one of these events then you simply have to come on over and see what all the fuss is about. You purchase the materials from me and in return I will not only provide you with a LIVE online class but I will also provide you with all replay videos...and you can even win some hostess rewards! Talk about a good time! Thanks for stopping by today. I hope you enjoyed my video.